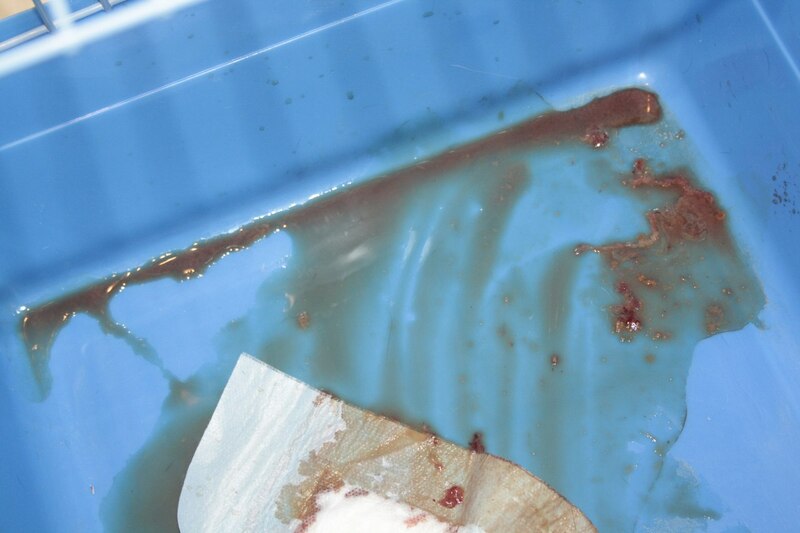 On January 21st she started throwing up blood and her stool contained blood. She would not eat or drink. Button had suffered abuse. She was found on a cold night outside crying for help. Her jaw was broken. SV group took her and fixed her jaws. 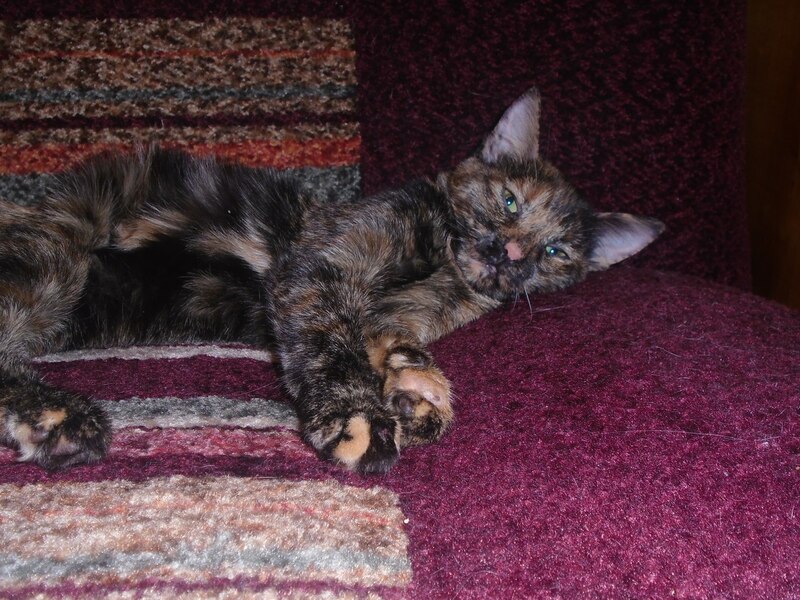 As we all thought she was almost healthy for her forever home, but a few days ago she stared feeling sick and fading. Button had internal injuries, her liver raptured. Please read her rescue story in our earlier posts. Animal abuse in Russia is unfortunately a common practice and there are almost no laws protecting them. The Russian government actually spends money on hiring firms with firearm licenses to kill homeless animals and it is a fact. Also a self-proclaimed society called “Dog hunters” formed by morons is killing homeless animals (cats and dogs) and pets daily. Animal activists in Russia are fighting for animal rights and we hope the government will respond to multiple petitions and letters to the president. Lapa is the one out of five homeless puppy who survived from the cruelty and stupidity of certain humans (see our previous posts). Now Lapa is in good hands and gaining weight slowly. One day into the treatment. All her siblings died at that point. Lapa is struggling psychologically. She is a very shy scared timid puppy. She has a fear of closed doors and cannot sleep in a room without the light. 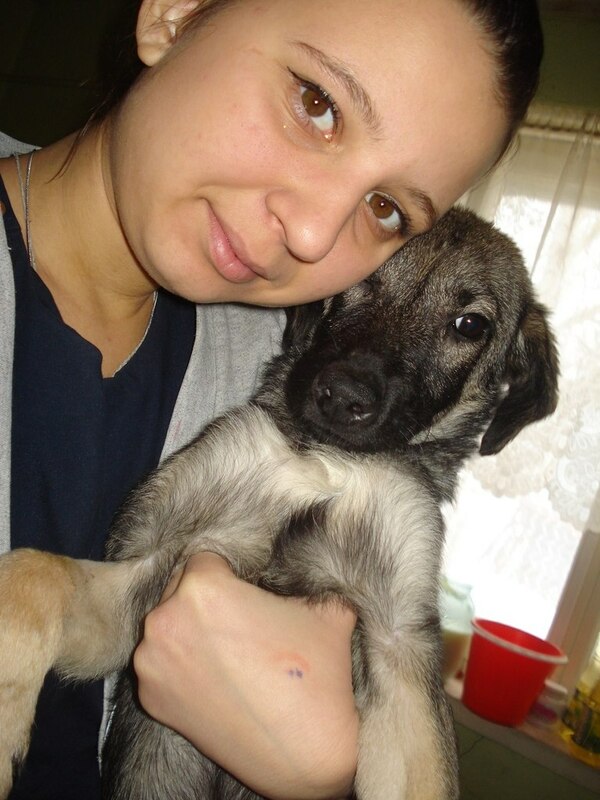 She is being cared for in her foster home by Angelina (foster mom). We hope she will be healed soon physically and emotionally. Please help us raise money to cover the cost of food for Lapa. Please help us help more animals in need. Any amount will go a long way! 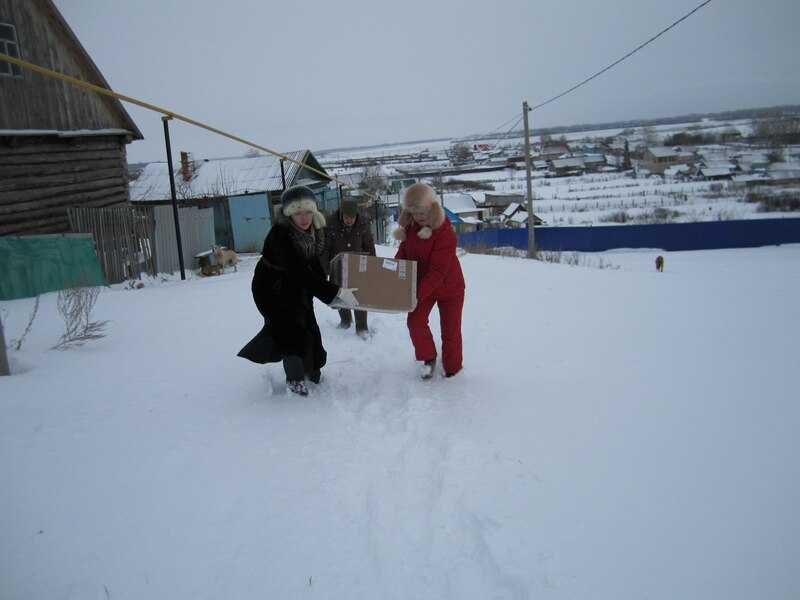 Sterlitamak Volunteers is an organization that exists and works directly off of the donations received from general public. All Volunteers and organizers of this group are working as unpaid volunteers and all proceeds go to cover the cost of medications, transportation, food and surgeries. 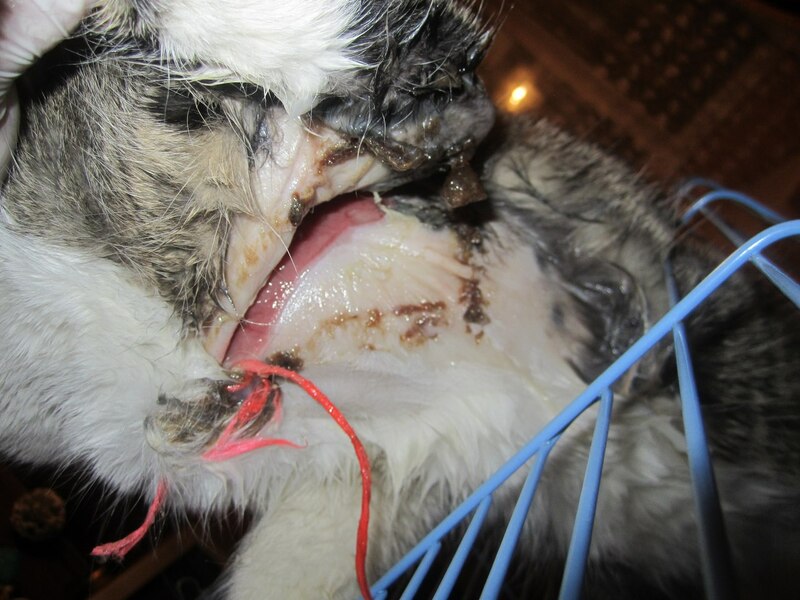 The young cat was found this week with string imbedded deep into the skin around the neck and under the front legs. 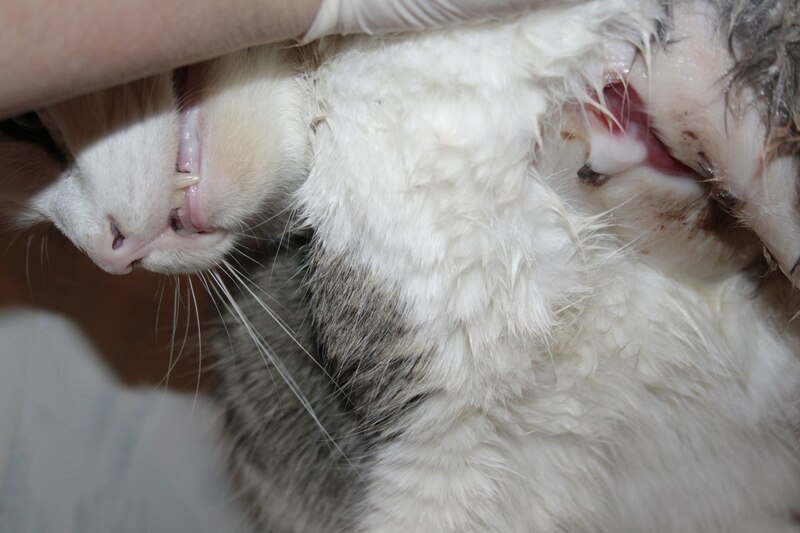 After removing the the string, the vet decided not to stitch the wounds and let them heal on their own with application of antibacterial ointments and regular shots of antibiotics. He was someone’s pet before as his foster mom says. He is very thick and clean. 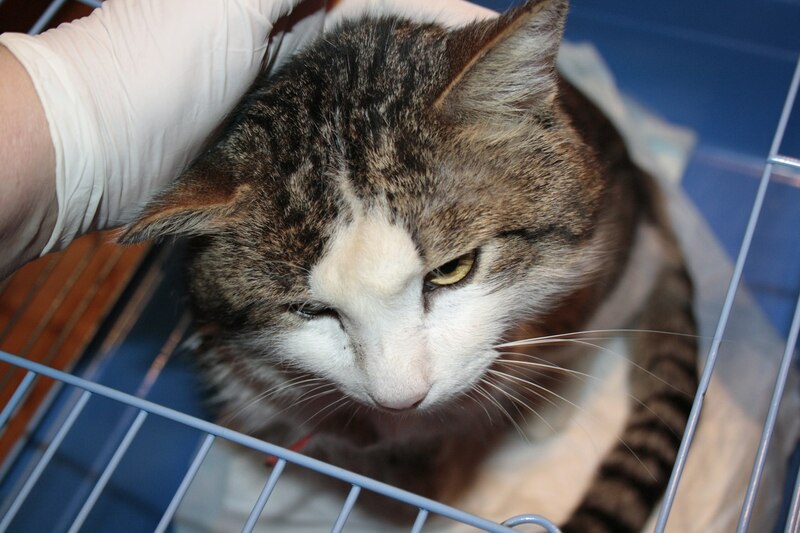 Except for the unfortunate wounds on his body, overall he is a healthy young male cat who has already been potty trained. We hope he gets well soon and will start looking for his forever home. Please help us save more homeless animals in need. Any amount will go a long way. Button was found by a good Samaritan before New Years Eve. The kitten was visibly in distress. She had a broken jaw and was outside crying for help. 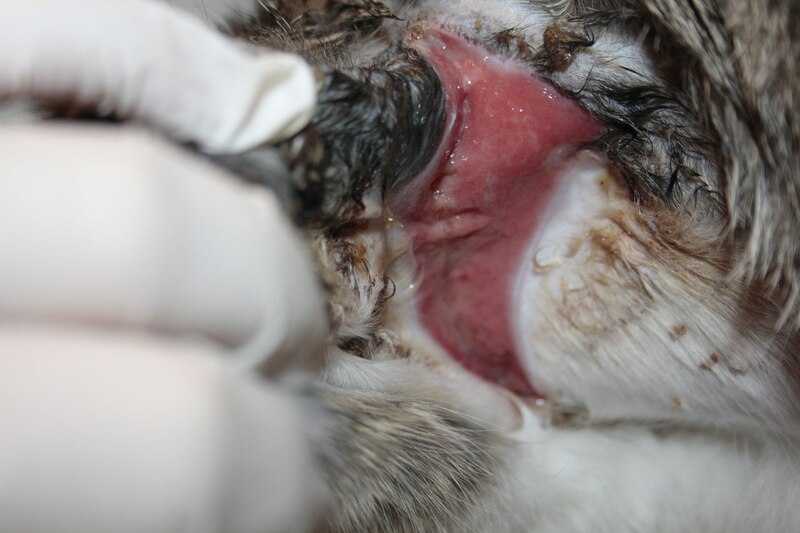 Button’s jaw has been fixed, stitches have been removed. SV group has raised money for her surgery and treatment. 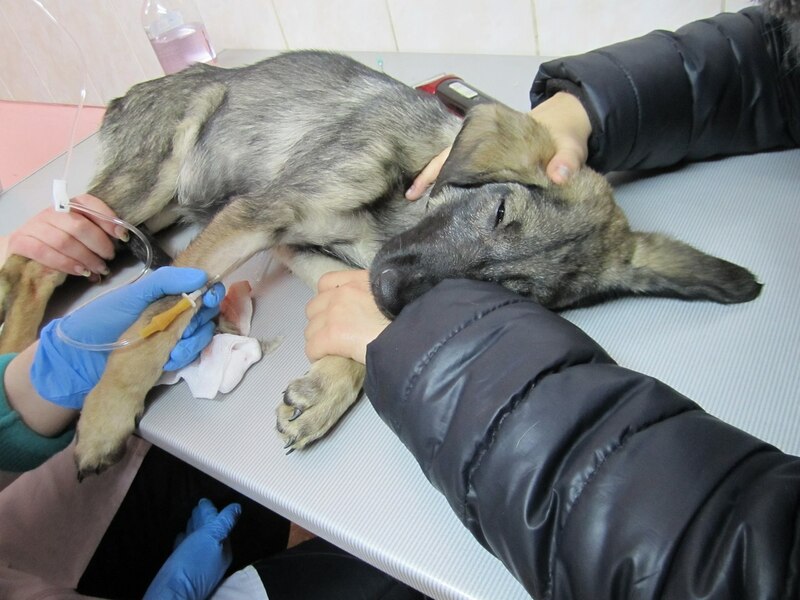 The surgery was almost free (thanks to the vet clinic) and the rest of the raised funds went towards her food and medications. Button is a curious lovely 3-colored kitten. She follows her foster mom everywhere and can be heard purring from a mile away. One thing that she is struggling with is her fear of man (males only). Whenever she hears male’s voice Button starts meowing unstoppably and she also tucks in her head whenever her foster mom is trying to caress her head. She has been doing a good progress and let the foster dad pet her when Button was almost asleep. 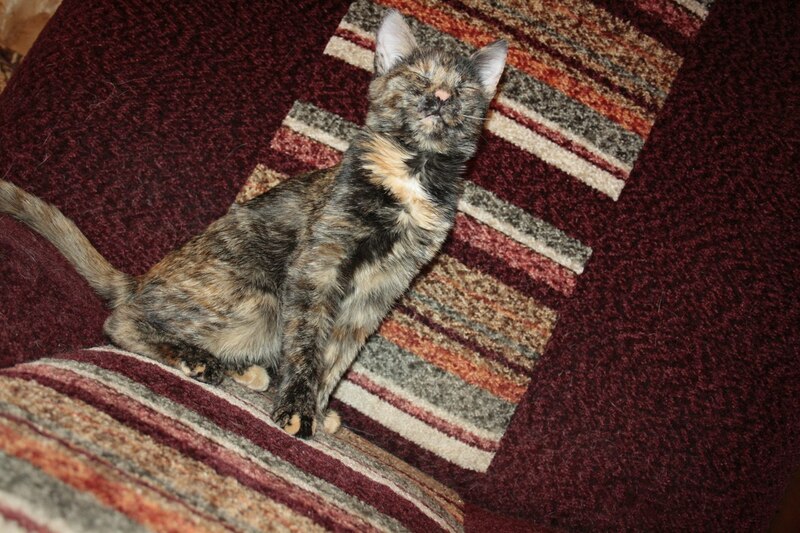 Button is a very beautiful lovely cat with bright green eyes. Purring and not opening her eyes. SV group has already started looking for a forever home for Button. We hope she gets all healed up soon and get into a loving forever home. Please help us turn more homeless animals like Button into healthy happy pets! 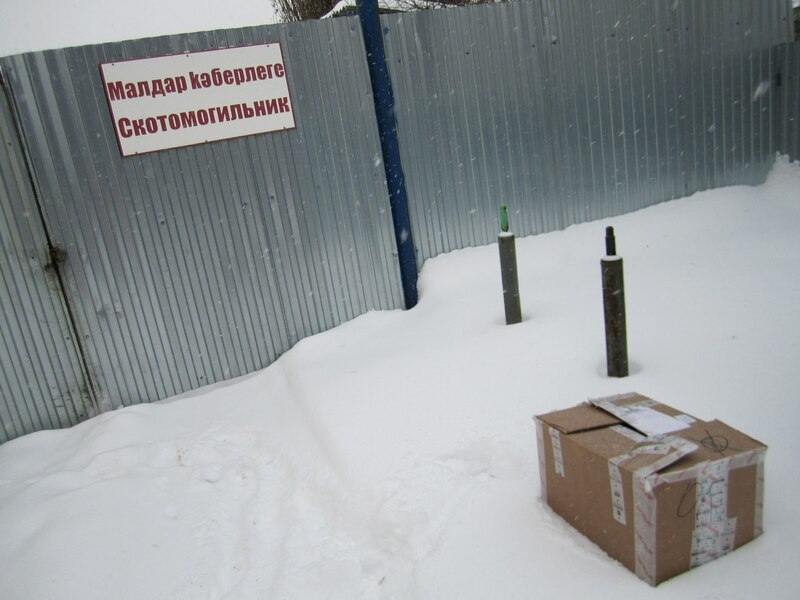 A small donation will go a long way in Russia. Please donate! 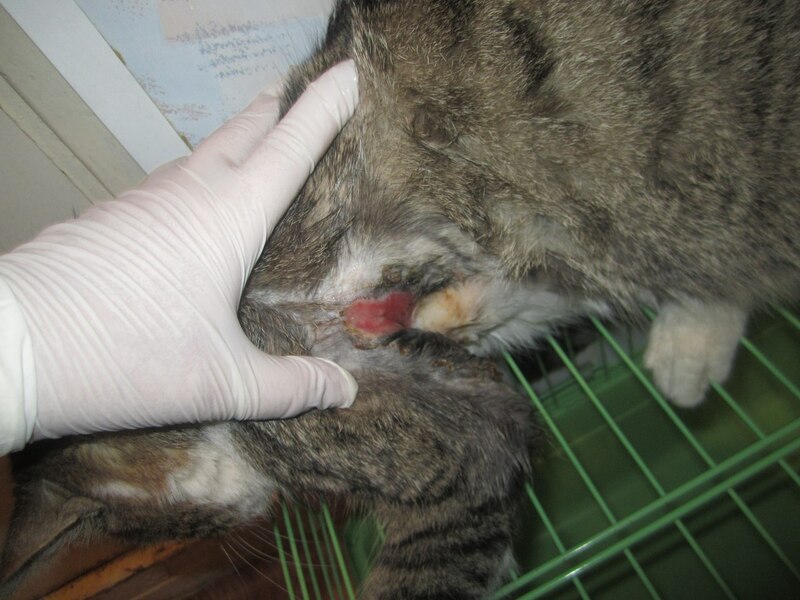 Today SV group found a stray cat in horrible condition. 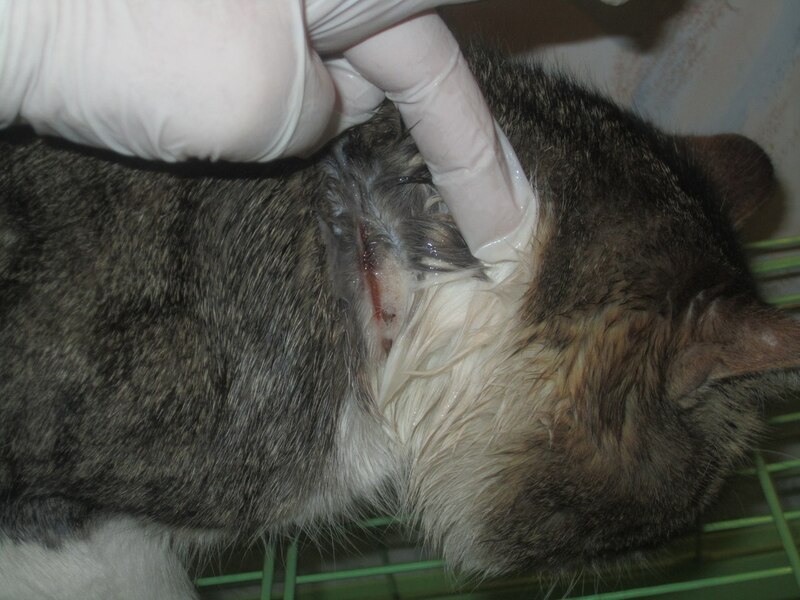 The cat is in a lot of pain and has open wounds caused by string tightened arounds its body. 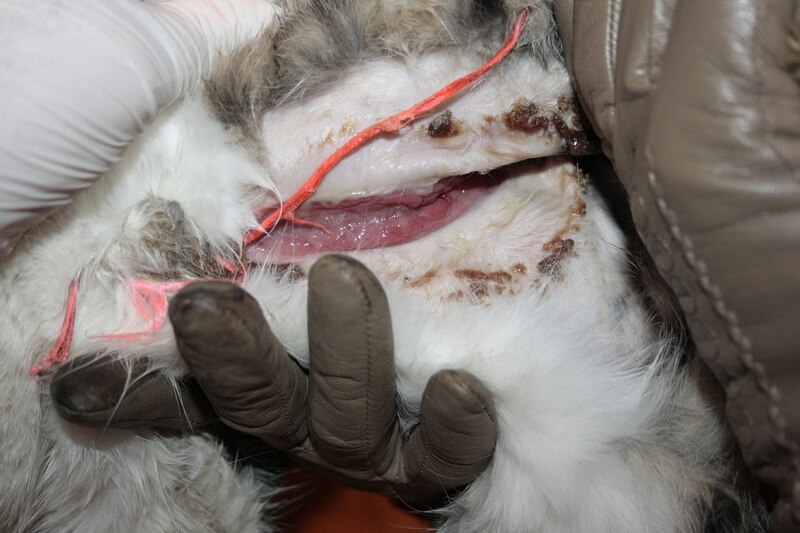 The string is imbedded into the cat’s skin making it a gruesome scene. 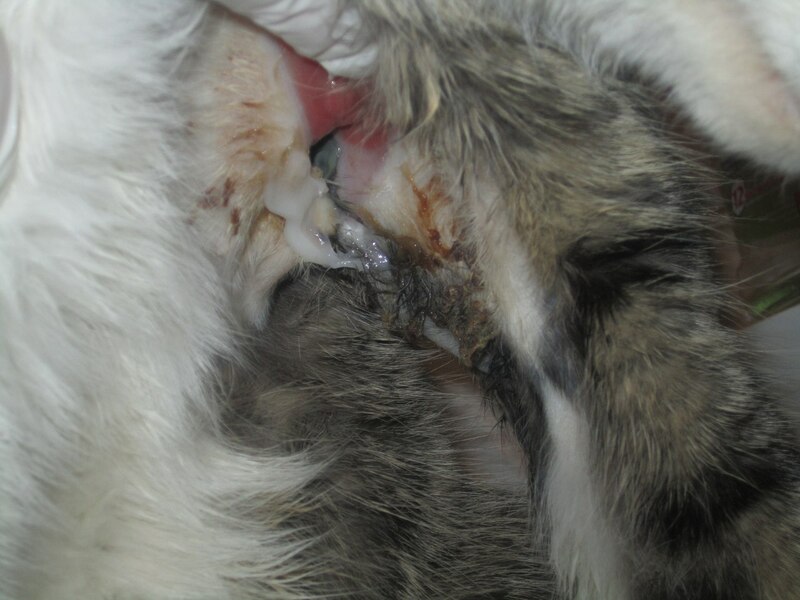 The odor coming from the wounds is unbearable which means the cat has been in this condition for a few days. Please be advised that the images are graphic. Deep wound in the armpit area. The sting is cutting into the flesh. 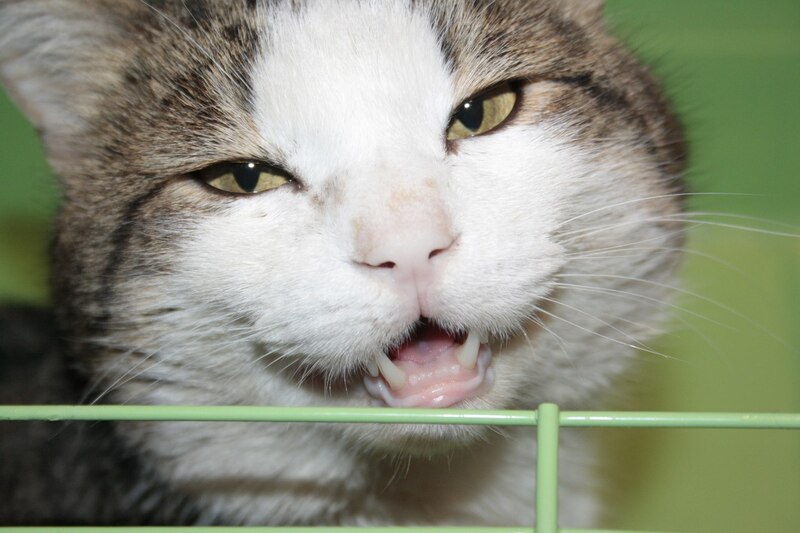 The cat is in pain whenever you touch the string. 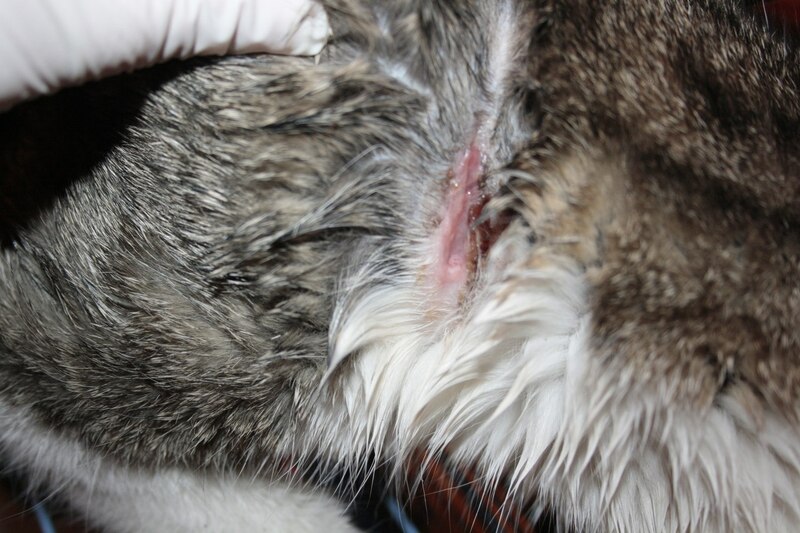 The vet visit is schedule for tomorrow morning to remove the string and stitch the wounds. The cat seems to be clean and well fed, the cat has good weight and good coat. 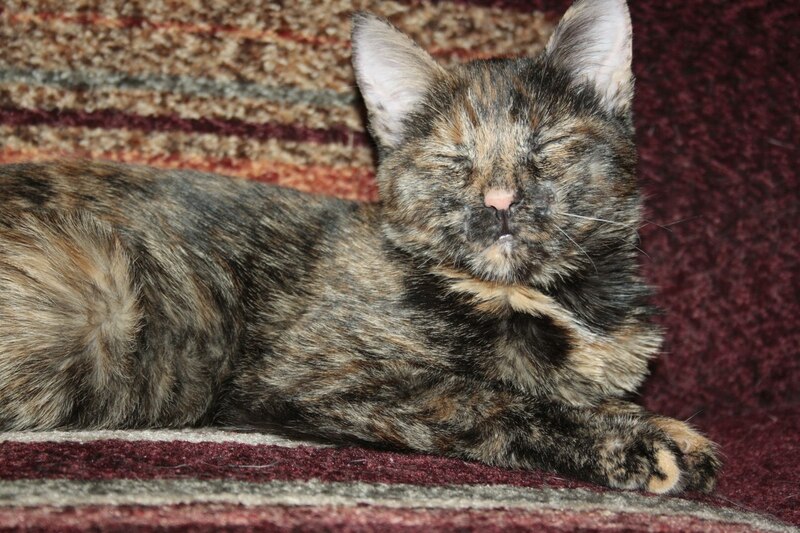 SV group started a fundraise for this cat. Any amount will go a long way. More post will follow. This story happened just before Christmas 2014. 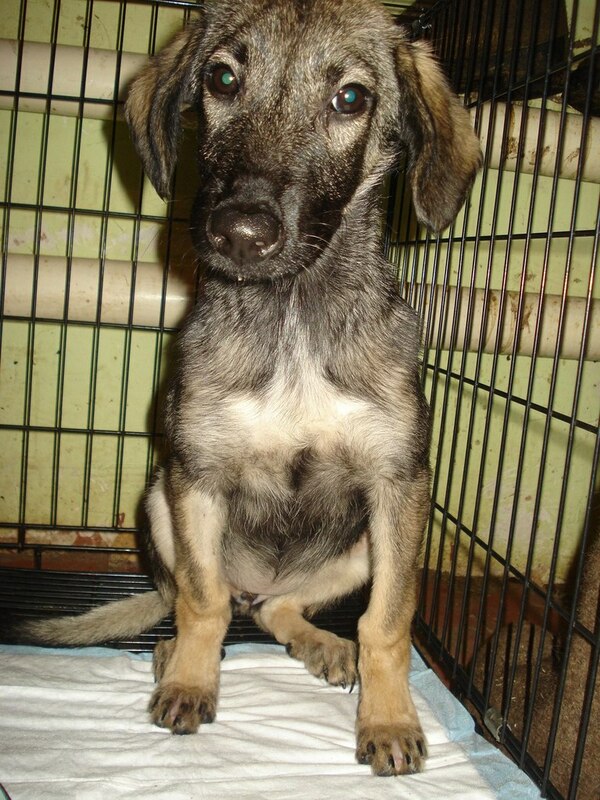 SV group received urgent plea for help about 3 survived puppies (there were 5 initially) on December 24th. According to a good samaritan, the puppies were fostered by a family who could no longer take care of them and they got rid of them by abandoning puppies in the woods further away from the town without food, water and shelter in below zero temperatures. 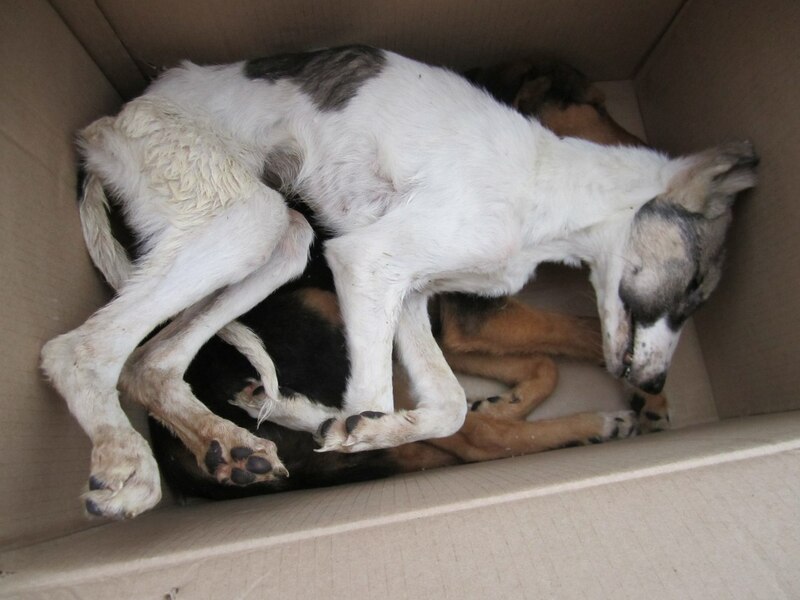 As you can see the puppies were very malnourished and could barely stand on their own. We do not know whether the “foster parents” (if they can be even called that) were feeding the puppies. On December 24, 2014 the puppies were brought to one of the Volunteers homes. All 3 puppies were shaking and lethargic, could not stand on their feet. IV fluids were given right away. Half an hour after the puppies arrived 2 puppies passed away. The only survived puppy was in a critical condition. After failed attempts to ask social media followers to help with transportation to take the puppy to the vet clinic, the Volunteer who fostered the puppy took the crate with the dying puppy on a bus and brought her to the vet. The volunteer carying the puppy to the clinic. The puppy turned out to be a girl. 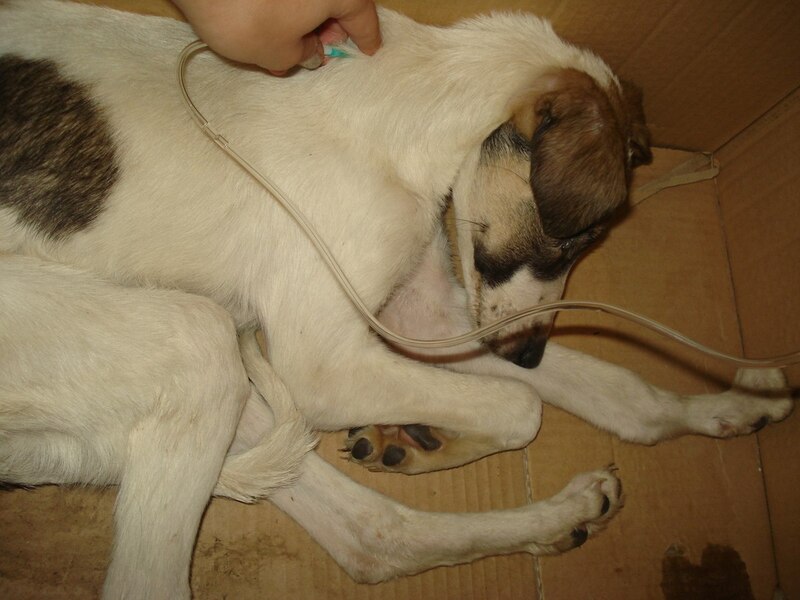 She was given necessary IV fluids and medications. The treatment continued at foster home. Meanwhile the tiny bodies of 2 puppies who previously passed away had to be buried (the vet clinics do not provide cremation services). In order to properly burry the puppies SV group wrote a post on social media website asking for any volunteers to take them to the animal cremation center (located a few miles away from the town) or dig a grave for them. Nobody responded. The organizer of SV group and some of the Volunteers drove to the cremation center on New Year Eve. The weather was very brutal that day. The survived puppy is doing better now. She is a very smart and polite dog. She can walk around her crate and now goes outside to potty. When her foster mom at school, she is very quiet and uses a pee pad. She also started eating on her own and gained some weight. She learned how to give a paw and she was named Lapa (which means “paw” in Russian). 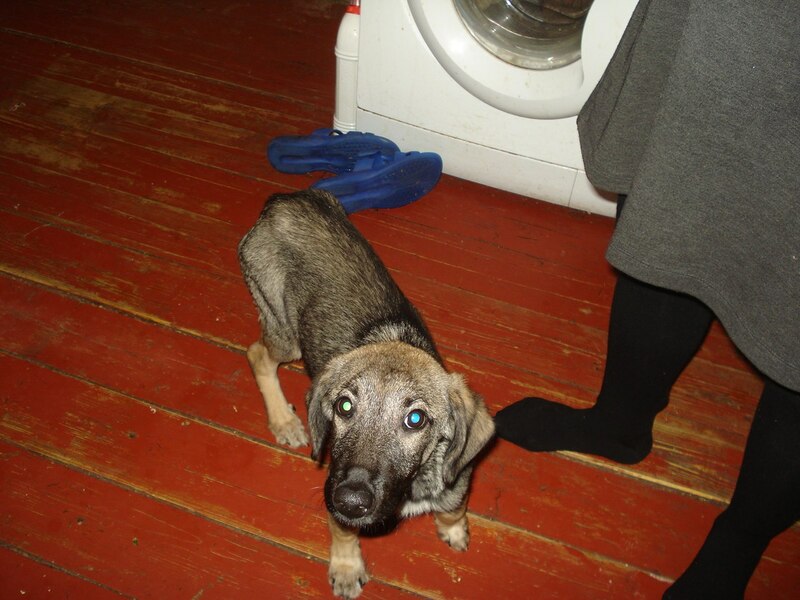 Lapa is a shy puppy but we know that when she is all well and healthy we will find great parents for her and she will blossom into a playful and happy puppy as she should be. This is a very sad story with a happy ending for 1 puppy out of 5! We wished we had saved them all but the help came too late. Please make it your resolution for 2015 to help animals in need. If you see or hear about animal abuse, please report, stop the abuse and help the animal in need. WE ARE THEIR VOICES AND WE CAN SAVE THEM! The kitten is doing great! 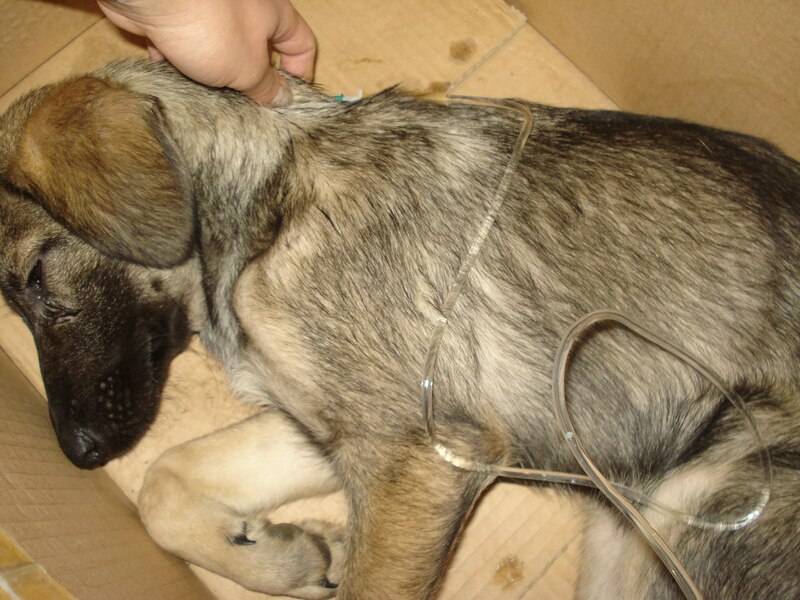 The Volunteers named her “Button” (or Pugovka – in Russian) because of her make-shift wiring. The swelling on the jaws has subsided and now she can eat on her own. Also the rotten odor that was coming from her jaws is gone. 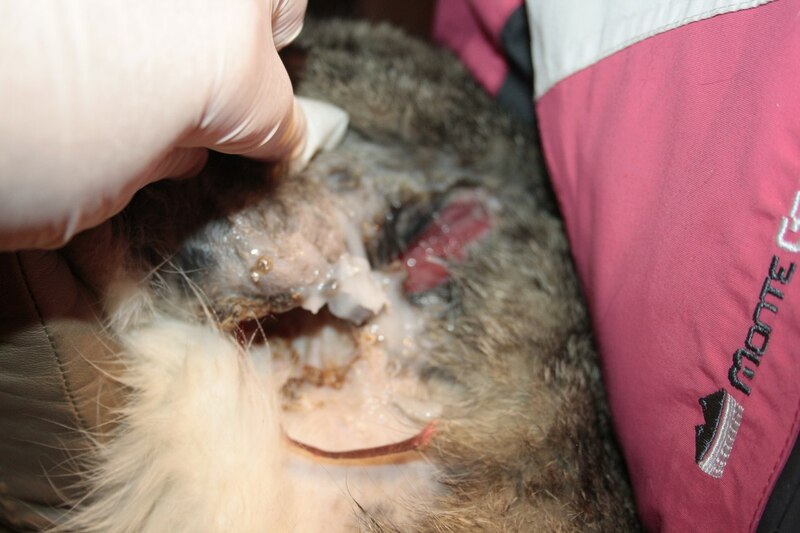 Button is receiving shots of antibiotics daily and all her stitches are being disinfected after feeding. The only problem Button faces is the emotional: when she hears male’s voice, she starts crying very loudly. We suspect that whoever physically abused her was a male. The good news is that Button is in good hands and we hope that she will soon recover physically as well as emotionally. Button is a very polite lovely cat, she uses her litter box, eats well on her own and snoozes all day long. 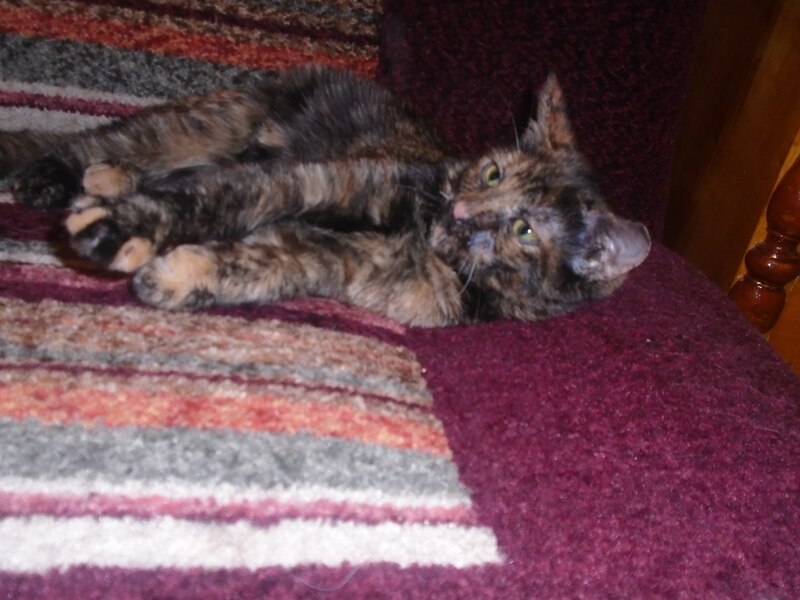 After her complete recovery the Volunteers will be looking for her forever home. Please help us make a difference in lives of many animals like Button. Please donate. 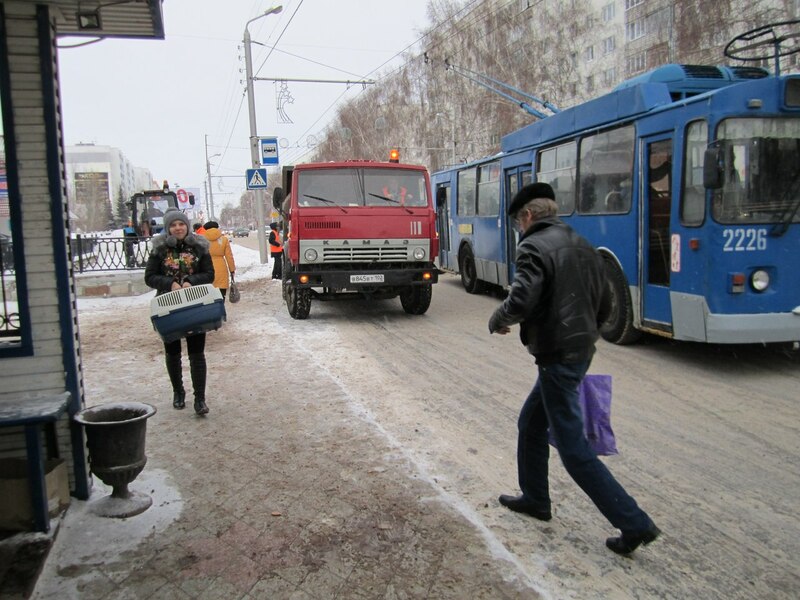 Any amount will go a long way in Russia.